Last Updated: March 24th 2019: The main purpose of a PEX Manifold is to be used in a distribution center in plumbing or heating system – this means that there are different types of PEX Manifolds in the market. 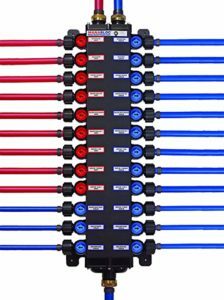 The main role of a PEX manifold is that it allows a user to setup automatic flow, monitors temperature and flow control – this is especially important when it comes to heating and plumbing. 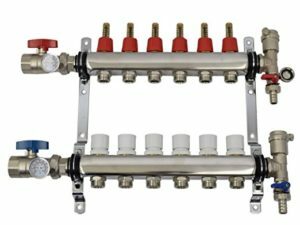 In this best PEX manifold guide you will learn everything you need to know to select the best manifold that will make your demo much easier! What we found with PEX Manifolds is that these gadgets can save you a lot of time when it comes to eliminating leakages associated with the assembly of different parts which include fitting, ball valves, and pipes. Most of the time manufactured manifolds cost way less than the individual components which mean that it is a great buy if you want to save some money in the long run. Before we begin, we also have a guide on the best PEX crimp tool which will make your whole installation much easier! The types of PEX Manifolds when it comes to heating manifolds and plumbing manifolds are significant. 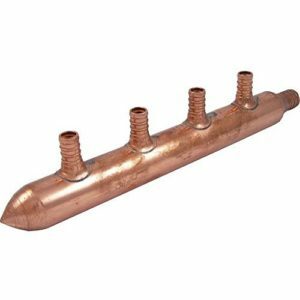 When it comes to heating manifolds, the main thing that matters is the size of PEX pipe that is used for floor heating and then also the size of the heated area. 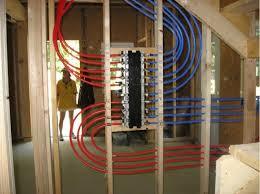 What we found is that if you have an area of 1,500 square feet space, then it would require about 1,500 feet of PEX. But when it comes to plumbing manifolds because hot and cold water plumbing require separate PEX plumbing manifolds, they are sized and selected based on the number of inlet and outlet pipe sizes. This means that if you need something for your whole house, we recommend just getting larger manifolds whereas if you need something for your point and use applications you can just use a smaller manifold. Because there are quite a few different manifolds on the marketplace and each one has different specifications, I have decided to review a few of my favorite ones to give you a good idea of which ones are quality choices for you to choose. The first one this list is the Viega 36183 – if you need something solid to cover up the fittings on your water supply, this is the right pick. One of the reasons that we loved the Viega 36183 so much is that it has parts that are specific to it which means that the parts work exactly as they should, and they are extremely durable. The only downside is because these parts are specifically made, not all local stores will carry them, but no worries, we can get them all online! Another thing that we loved about the Viega 36183 is that it is an easy hook up which means that you do not have to spend much time or effort trying to get it to where you need it. It has a very slow adjusting tightening which means that you should have a wrench by your side when you are trying to put the Viega 36183 together. In fact, we are confident enough that even if you are not a plumber, you should have no trouble installing the Viega 36183 with minimal use of the instructions – installation is a piece of cake. The only downside we could find with the Viega 36183 is that you might need to buy three additional fittings so you can add PEX supply lines to it. This is not too big of a deal given that these additional fittings are pretty cheap and you can pick one up on Amazon with the main product. Our runner-up pick for this guide is the Rifeng 6 loop stainless steel PEX manifold! This is an absolutely beast of a PEX manifold in a beautiful stainless steel finish. 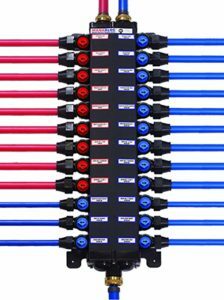 This PEX manifold comes in five different sizes, four loops, five loops, six loops, ten loops and twelve loops. This variance in size gives you the ability to place this PEX manifold in a variety of different places and situations. For example if you need quite a few different pipes for a large amount of appliances then go with the large manifold, but if you only need a few, then you can get away with the six loop or smaller. 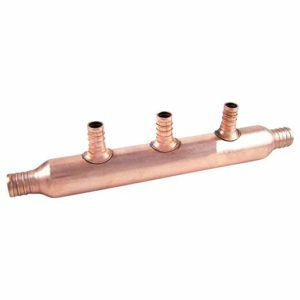 All of the different variations to this PEX manifold are 1/2" compression connectors and features a heavy duty mounting bracket that is extremely durable and can take a punch. Along with this, these manifolds are equipped with automatic air vent/eliminators for added safety. One of the main reasons I love this manifold is because it features body flow meters with adjustable flow rates which help you set up your water lines exactly how you want to. Also, each individual connection have their own shutoff valve which is extremely helpful for troubleshooting and when there is an issue with a line or with an appliance on the other end. Overall this is an extremely good PEX manifold and if you are looking for something that will last you years on end while allowing you to have a huge amount of options for setup, then I suggest this Rifeng! Last but not least we have the SharkBite 22785 – this is our budget pick so if you need something cheap then pick up the SharkBite 22785! What we loved most about the SharkBite 22785 is that it is easy to install, quick to install and has no leaks throughout the system. Anything that we loved about the SharkBite 22785 is that it is cheap and inexpensive, you do not need to spend a fortune to buy one. 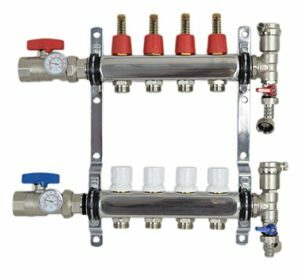 In fact, if you need to buy multiple PEX Manifolds then we highly recommend that you get this one because you can get multiples of it at a low price. Additionally, we found that since the SharkBite 22785 is built with a copper body (lead-free compliant), this means it is safe to use with your water sources – no need to worry about getting your water dirty with bad metals. On the SharkBite 22785, it has a 1-inch trunk with a ¾ inch barb inlet and outlet – what we found is that this is bigger than most of the options out there but if you need something even, keep looking around. The only downside we could find about the SharkBite 22785 is that it is not pretty. Meaning that if you are looking for an aesthetically pleasing PEX Manifold, then you should look elsewhere. We would like to admit that even our main and runner-up picks are a lot more aesthetically pleasing than the SharkBite 22785! In conclusion, if you need a solid pick read through this guide and pick a PEX manifold that you think you will like in your house, whether it be our main pick, the Viega 36183, or if its our runner-up the Viega 50243 or if its our last pick the. Regardless of what you pick you can’t go wrong with the ones that are on this list. PEX Manifolds are handy when it comes to making sure that your plumbing and heating are properly distributed. You'll be able to monitor and direct flow control with a PEX Manifold – so for a low price, pick one up today!